Haitian-born Ron Duprat is working with some of his fellow season 6 cheftestants to offer some relief to his earthquake-damaged homeland. Read more here. Season 6's Eve Aronoff is opening a new Cuban-influenced restaurant in Ann Arbor. Cheftestants Stephanie Izard, Dale Levitski, and Tre Wilcox will be appearing at the 2010 International Home + Housewares Show to be held March 14-16 at Chicago's McCormick Place. Also appearing will be former Top Chef guest judges Todd English, Ming Tsai, Gale Gand, Rick Tramonto, and Top Chef Master Rick Bayless. Find more info here. Michael Voltaggio won a $100,000 shopping spree at Macy's. So what did he buy? Jenn Murphy of Sweet Water is back again with two more Top Chef season 6 dishes. Enjoy! I think the name of this dish is a bit misleading. However, to list all of the starring components in the title might cause you to faint from hunger before you even get through reading it. This is one of those special dishes where, to quote the great Tom Colicchio (and other random, lesser notables), "The whole is greater than the sum of its parts." Bites of each ingredient on its own are tasty in their own right. But a single bite including a taste of each component part makes the dish a whole other thing; an experience unto itself. But the thing is, I'm in awe of someone who can take all these separate ingredients and make them work not just as a harmonious whole but also showcase each ingredient independently of the rest. I'm gonna go ahead and guess that that's part of what made Michael Voltaggio the winner of Top Chef this season. I know it seems a bit summery for, well, the dead of winter but it was just what I was looking for after all the holiday heaviness. Refreshing and light. An important note, I used Atlantic Cod, not Black Cod as in the original. 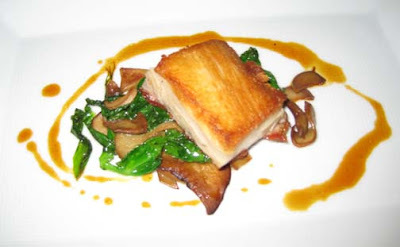 Did you know that Black Cod isn't even really Cod, it's sablefish? I am very aware of the issues of sustainability and over-fishing of this fish. In fact that's partly why I chose to use it and not Black Cod. I'm a Newfie (half-Newfie anyways) and my family in Newfoundland was greatly affected by the moratorium placed on the cod fishery by the Canadian government 15 years ago. There is some good news for the Atlantic Cod. It is being successfully farmed and wild Cod stocks have recovered to the point where limited fishing is being once again allowed off the coast of Newfoundland. Proof cod fishing has re-opened? We have a freezer full of the stuff, brought back from my Dad's trip "down home" this past summer. But now back to Michael Voltaggio and his delicious creation. It's been a while since I cooked anything Asian inspired. I almost forgot how much I love it. Each ingredient was so vibrant but so balanced. All the bright citrus contrasted with the earthiness of the dashi broth and the delicate cod. And then there was the watermelon. That was the most surprising part of the dish for me. I wasn't totally sure how watermelon would fit in with citrus, fish and Asian flavours. But the watermelon really tied everything together. There was a lot of prep for this dish (my arm hurt from zesting) but the actual cooking was totally simple. And so good! Did I mention it was good? Mix miso, mirin, and tamari soy sauce together. Spread on sheet tray. Place fish on tray flesh side down. Marinate for an hour. Place kombu in pot with 3 cups water. Bring to a boil and immediately remove from heat. Add bonito flakes. Steep mixture for 3 minutes. Place sliced shitakes in a bowl and pour steeped kombu mixture through a strainer and over the mushrooms. Add ginger and allow to come to room temp. Chill mixture over ice bath. Add orange, lemon and lime zest and juices, tomatoes, green onions and soy sauce. Cut watermelon into 2 inch thick rectangles and marinate in lime zest, juice and olive oil. Remove fish from marinade. Wipe off excess cure and Pat dry thoroughly with paper towel. Cut into serving sized portions and slowly sear in a pan with oil (skin side down.) Sear until skin is crispy then flip and finish cooking. Allow fish to rest. Place marinated watermelon in bowl and spoon in dashi broth. Place fish on top. Garnish with green onion. Three out of the four Top Chef recipes that I have recreated thus far have been Kevin's. When I look at the list of recipes that I copied down from the Bravo website (no criteria other than instinctive stomach growling) there is a fair mixture of the different chefs. But something about Kevin's dishes have just drawn me to make them first. Maybe it's the apparent simplicity of Kevin's food that makes it seem like a good way to wade into Top Chef re-creationism. Or maybe it's the obvious comfort food aspect of Kevin's cooking. The stick-to-your-ribs ingredients and preparations are perfect for this time of the year. Still, maybe it's because when I start out to cook one of Kevin's dishes I recognize that my Mom would have loved it. The flavours are bold, but simple. The ingredients stand on their own. There's no completed technique or scientific component to cloud the experience of the food. It's just straightforward good cooking and a wonderful understanding of flavours and how to bring disparate components together on a plate. 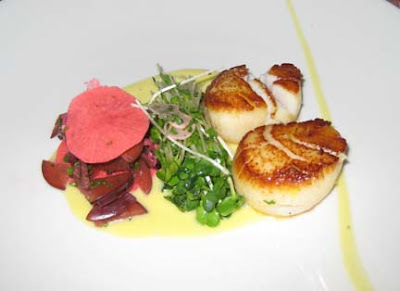 The simplicity in Kevin's dishes is derived in part from his focus on local, sustainable and organic ingredients. This is another reason I'm drawn to his recipes. When you look at Kevin's food, at the same time thinking about his food philosophy, you can't help but realize the simple logic of a focus on the ingredients in your immediate environment. "What grows together, goes together." Kevin's food is harmonious. It is comfortable. Most importantly it is damn good. And that is in no small part due to his food philosophy. For this week's Top Chef recipe I cooked one of Kevin's finale dishes; the one inspired by his mother. There was something about the decadence of cooking just the chicken skin for the dish (after so many years of eating skinless chicken breast I couldn't resist!) That and the squash puree that Tom Colicchio specifically complimented Kevin on totally called out to me. * I used 2 small carnival squashes that I received in my Good Food Box. The taste is quite similar to butternut squash but milder. Remove skin from chicken. Remove all fat from skin (should have only thin layer of skin remaining.) Place in small bowl or ziploc bag and add salt, pepper, cayenne, sugar. Rub mix all over skin. Refrigerate for at least one hour. Blot dry with paper towel. Fry in oil at 370 degrees until golden brown. Break into shards. While chicken skin is refrigerating: Saute onion and garlic in butter over medium heat until lightly caramelized. Add diced squash to onions. Reduce heat to low and simmer until squash in fully tender (about 30 mins.) Add cream to squash mixture. Transfer squash to blender (or hand blend) on high. Season with s&p and lemon juice to taste. Pass through chinois. Reserve mixture. Score tomatoes. Blanch them in boiling water and then shock in ice bath. Peel skins. Season with s&p and olive oil. Spoon squash mixture onto bottom of plate. Top with tomatoes. Sprinkle on chicken skin shards. I know Kevin wasn't totally on his game in the final challenge and I know that (obviously) it wasn't the favourite dish of the day. But it was still a damn good dish. For me it was another experience of the whole being greater than the sum of the parts. On it's own, the chicken skin was pretty salty for my taste and the tomatoes, well, I wasn't sure I understood their role at first. The squash, on the other hand I could eat anytime, anywhere, under just about any circumstance. A bite of all the components together though? Suddenly the chicken skin is refreshed by the tomato and balanced again with the earthy squash. The citrus of the squash cuts through the density of the chicken and adds brightness to the raw tomato. Each ingredient is most effective in bringing out the notes of the others. Fan-freakin'-tastic. Who else wants to run out and buy a CO2 container right now? Top Chef Restaurant Experience Needs You! As some of you may have become aware, I have resigned my place in this year's Bocuse d'Or semifinals. I did this with a heavy heart, but knew fully that I was unable to perform to the highest standard required of the competition, considering my current professional obligations. I felt like someone else deserved the opportunity, and wanted to see our country have the best people representing it. The January 2010 issue of Food & Wine has the potential to scare. Right there, at the top of the cover, in big bold print, are three little words that so many cheftestants fear (with good reason): The Judges' Issue. 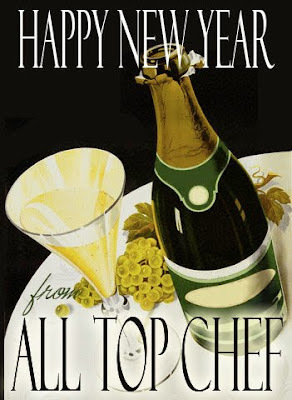 Fortunately, as a Top Chef blogger, those words look like beautiful art on the page. The January issue is pretty judgy, too, with Frank Bruni torturing Eric Ripert's amazing sommelier, Aldo Sohm, and restaurant critics from all over the country opining on their favorite chicken dishes. Plus, there's Gail. Lots and lots of Gail. And the best Gail is in the article, "The Gail Simmons Challenge: Rescue that Top Chef Recipe." It's pretty much as it sounds - Gail reworks some of the failed recipes from seasons past, turning disasters like CJ's hideous airplane broccolini and Jennifer Z. 's notorious chiles rellenos into workable, edible dishes. Feeling cheffy myself, I attempted Gail's reinvention of Carla's Roquefort souffle that never made it to the plate in the season five finale. While I've eaten a lot of souffles in my time, I hadn't made one before, so I thought it would be a good test of a) the simplicity of the recipe and b) whether my kitchen confidence is unfounded. And you know what? The recipe is not that difficult and I do, apparently, have some skill in the kitchen. I switched out the Roquefort for Stilton (because my grocery store was having a Roquefort-free day) and used a combination of heavy cream and skim milk for the cup of milk (it's unspecified in the recipe). I also used eight 1/2 cup ramekins instead of four one cuppers...because it was what I had. As a result, I decreased the cooking time by just about four minutes. Overall, the recipe took a little longer to make than I'd anticipated, and I might have overbeat the egg whites just a tad, which slightly dried out the souffle, but they rose in the oven and had great flavor on the plate. The intensity of the cheese and is a good match for the chives and for the airy texture of the souffle. Paired with a green salad, just the way the article photos suggest, it's a nice light meal. And pretty, pretty, pretty. While the just-out-of-the-oven puff didn't last forever, I was able to bask in its glow for a few seconds as I fumbled with my camera. The verdict? I might make it again to fine-tune my souffle-making skills. It's ideal for a fancy brunch or a ladies' lunch, though not quite hearty enough on its own as a winter dinner for me and my big strapping husband. Not bad, though. Gail has done Carla proud. Hootie hoo! Bryan Voltaggio is scheduled to appear at the 22nd Annual Chocolates Galore & More! event, scheduled for February 19, 2010. Click here for more info. Season 5 Fan Favorite Fabio Viviani will be appearing at the Taste trade show in Myrtle Beach, May 14-16. More info can be found here. 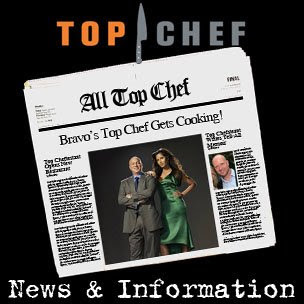 Season 5's Ariane Duarte discusses Top Chef and offers a recipe in this article. Carla Hall, also from season 5, will be judging iVillage's "Clean Your Plate" recipe contest. Read more about it here. Padma Lakshmi made AskMen.com's "Top 99 Most Desirable Women" list. Check out her competition (including the Food Network's Giada DiLaurentiis - but don't you think Gail Simmons should be ont he list?) here. And...potential news for fans of season 1 hottie Sam Talbot - he and his wife are splitting. On Monday morning Tom Colicchio stopped by the Today Show to show Matt Lauer and Meredith Vieira how to make two kinds of stuffed pasta. Every season of Top Chef has outdone the last. After Top Chef: Vegas I'm not sure how it could get any better. The talent on the show was incredible. The food produced was both beautiful and, more importantly, yummy. Or at least I think it was yummy. I'm mostly taking the judges' word for it that having to decide a winning dish based on basic use of salt and pepper as seasoning because the overall taste level was so high means that the food was incredibly good. Why didn't it occur to me until now to actually attempt to cook some of my favourite dishes from the show? I'm gonna go with the old stand-by and say that my general lack of the use of logic had a lot to do with it. But no more will I sit idly by and drool at my television. Of course, that's partly because the Top Chef season is over (and I'm crying inside). I started with Kevin's recipe from the second last episode. I was totally in love with the dish the moment I saw it. It was gorgeous on the plate and a beautiful showcase of the flavours of carrot and beet. * I made a syrup by cooking down apple cider until thick. ** The original recipe called for chives, which I couldn't find. *** Original recipe called for San Andre cheese - a no go for me. As a note, San Andre is apparently made in the style of a pecorino so the next time I make this, I'll be going with that type of cheese. Trim ends off beets making one side a flat surface. Cover the bottom with 1/8 inch of water. Cook at 400 degrees for 90 minutes. When cooked keep covered with foil until beets reach room temp. Place carrots in single layer in deep saute pan. Cover with water, butter and apple cider syrup. Cook uncovered on medium high heat until liquid is absorbed and carrots are just tender. If carrots are not tender add more butter, water, syrup and cook a little longer. Remove from pan immediately and let cool. Combine carrot tops, green onion (chives), parsley and tarragon in blender. Add 6 ice cubes. Add enough olive oil to cover 3/4 ingredients. Blend on high. Add water if mixture gets too thick. Season with s&p. Strain mixture. Put strained mixture in covered container and refrigerate until ready to serve. Boil honey in pot. Keep close eye on honey to observe it darkening by stages. When it has darkened a few stages add apple cider vinegar. Bring to boil. Season with s&p. Whisk in 1 cup olive oil. Toss the carrots and beets with vinaigrette. Spoon puree on to plate. Top with vegetables. Add thinly shaved cheese. The verdict: This was SO good. I had to beg SeaBass to leave me enough veggies to take photos today. Immediately after posting this I will be finishing that little bit off! A couple of days before Christmas I tackled my second top chef experiment: Georgia Style Braised Pork Shoulder. Kevin's food is really appealing to me in it's flavour profiles and also in the simplicity of the preparations. As a home cook I feel comfortable with his recipes. Slice pork shoulder into 8 oz. portions. Season with s&p. 2 tbsp. oil in large stock pot. Heat oil to sear pork shoulder portions until browned. Transfer to large vessel to collect juices. Add vegetables to same stock pot and carmelize until golden. Return pork shoulder (and juices) to pot on top of vegetables. Add in remaining ingredients. Mix well. Place in oven for 2 1/2 hours. Remove from braising liquid and shred. I found my shoulder a little dry so I decided to add light coating of a Georgia style (vinegar based) barbecue sauce. It ended up going really beautifully with the flavours of Eli's potato salad and really brought the two components together. Combine everything but tomato paste in small pot. Bring to boil. Add tomato paste and stir until well blended and thickened. Boil potatoes and red onions in salted water until tender. Shock in ice bath and drain. In a large bowl mix vegetables and egg. Mix together mayo, mustard, relish, vinegar and sour cream. Season dressing with s&p. Add to salad and mix until potatoes cream together. Serve with Kevin's pork shoulder on top. My verdict on the dish: Deliciously tasty. The only potato salad I generally enjoy is my mother's but this one was wonderful and creamy, the mustard adding a nice boost of flavour. The pork shoulder was subtly seasoned with the pork flavour really coming through. It had a beautiful texture. I couldn't stop snacking on it and SeaBass was totally into it. Definitely worth trying. Please tune in next week for another installment of Cooking With Top Chef. 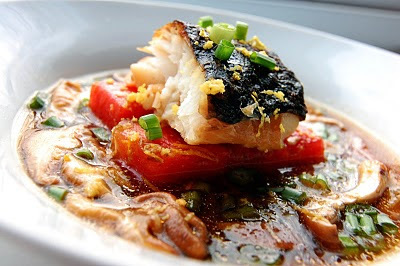 Jenn shares with us her experiences making Michael Voltaggio's miso-cured cod and Kevin's southern-fried chicken skin. 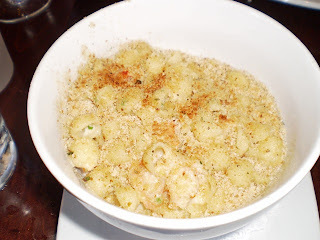 NYCMenuGirl is back, this time with details of her lunch at Season 5 cheftestant Jamie Lauren's restaurant, Absinthe, in San Francisco. 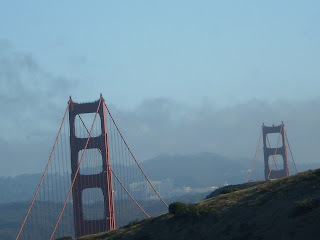 My time in San Francisco was limited to a mere 9 hours. There were plans to see a movie, get to the airport, etc., so one meal would have to do. There was not much time to learn the city, travel on public transportation, or hike up and down several hills to go to a restaurant. This is when that "go with what you know" instinct kicks in. For most people, that means a chain. For me, that means a restaurant with a Top Chef contestant from one of the 6 glorious seasons. Maybe it seems cliche and dorky, but I like Top Chef, and I always read up on the restaurants. It is my go to place, and it is better than defaulting to Red Lobster. It turns out that Chef Jamie Lauren from Season Five is the Chef of Absinthe, located a short 25 minute walk from where I was staying for the day. I loved Chef Jamie, and was sad to see her go on that season. My boyfriend's sister and our host for the day, Lenore, had been to Absinthe, and said we should go and try burgers. I felt even more confident now that Absinthe, one of the very few restaurants I know in SF, would be a good bet. My bf and I set out, down the SF hills, back up the SF hills, looking at the Aladdin like homes, and best of all, walking past the infamous "Full House house," which seeing felt like a true fulfillment of my childhood (I am being serious. Laugh it up. I don't care. You cannot take away my moment). I take my picture, and we keep walking. We arrive at Absinthe, located on Hayes Street (which means jack to me). We walk in, and it is so pretty. It has this brown and green earthy and elegant look. At 2 p.m. on December 30th, the restaurant is about 1/3 full. There are bottles of wine outside and on the walls. I love wine decor. Next time I move, I will not buy ANY art wall and I will decorate my whole apartment in bottles of wine. Even better - empty bottles of wine. Hmm. Must start drinking wine now to achieve goal of filling apartment with bottles of wine. I love New Years goals. So great. Back to Absinthe. We are seated. A lovely waiter comes by. Tap water of course. We peruse the menu. As we look it over, we get a plate of bread. It was a wheat sourdough bread. DELICIOUS. But, we knew we had sandwiches in our future, so we had to take it easy on the bread. A bread basket at lunch can be a nice addition, especially when you are having a soup or salad. But when you are going to get a sandwich, a bread basket is just overkill. We eat a slice, and put it to the side. Time to focus on what the menu has to offer. The sandwiches are $14 and under, entrees for $18 and over, and assorted cheeses. Appetizers at lunch are not usually my bag. My boyfriend says he may want the burger. I also want the burger. We never order the same thing though. It seems like a waste. One of us has to change, or we agree to split. PAUSE: As the guy who has to go out to eat with me the most, watch me take pictures of all of our food, and force summaries upon him at the end of the meal like some episode of Jerry Springer, I would like to say thanks Alex, for accompanying me to several of these restaurants, and putting up with all that comes with it, like dissuading you to get the burger so that I, NYCMenuGirl, can get the burger. Your blog support is noted. I decide to order the burger (score)! The Absinthe burger is $12.50, and includes aioli, red onion, lettuce, house-made pickles. Hmm. Not going to be good enough. For $1.50 extra, I order smoked gouda for the burger. Alex decides to get the croque monsieur (ham and cheese) for $11.50. Those are some pricy sandwiches. Ooo but what do they come with on the side??? O wait. Nothing. Side dish fail. We have to order a side dish separately. Well, I want fries of course, for a whopping $6.00. There they are. They came with three delicious sauces! We got 1 order, which was more than enough of course. And for $6.00, with the sauces, the price seemed right. 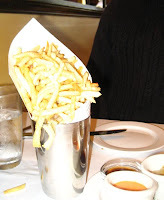 The only problem was that these were shoestring fries, which I like, but they were so small that they were not ideal for dipping. So, to sum up, Jerry Springer style, I liked the fries, and I liked the sauces, but I would have preferred thicker fries for the sauces. Now for the sandwiches. The burger was such a nice size. It was hand held, like a gameboy. Nothing too juicy falling out. The smoked gouda was great. And the burger tasted great. Still, not as good as The Smith, or Bill's Bar & Burger, but as we see the haute burger trend, this fits the bill. This is not the burger that is supposed to be greasy, falling out of your hands, as you prove how manly you are eating this piece of meat. This is the date friendly burger, where everything remains intact, and still flavorful. That is not to say that it is not as good. Not at all actually. But when you need a burger recommendation from me, the first thing you should tell me is if you want your burger "fancy style," "chow down style" or "sloppy sloppy style (which means, a totally sloppy burger, hence the second sloppy)." This burger was fancy style. On to the croque monsieur. This was actually a little greasy. But OMG did this sandwich melt in your mouth. Alex said he was surprised because he thought the croque monsieur would come on a fancy baguette, but instead it came on toasted white bread, and resembled a melt more than a sandwich. But it was delicious. And SURPRISE, salad on the side. That was a nice touch. The croque monsieur was definitely a full meal, and for $2.50 less than the burger, the value was much better. All in all, Absinthe was just lovely. The service was great. The menu items for lunch, although just sandwiches, are such upscale versions of sandwiches, that you don't feel cheated, like you could have made it and put it in your lunchbox next to your thermos (omg I want a thermos so badly. where you drink out of the top cop. maybe a full house thermos. a girl can dream). From VoltaggioBrothers.com, here's a video about making chocolate lollipops with a very special additional ingredient. 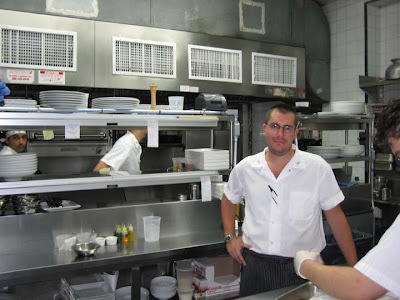 Here's an article about the fall and rise of season 4 cheftestant Dale Levitski. Top Chef Masters competitor Art Smith will be celebrating his 50th birthday at Soldier Field in Chicago during the 5th annual World Festival benefiting Common Threads on March 1st. Gail Simmons will be hosting, and participating Chicago-area chefs will include Top Chef season 4 winner Stephanie Izard and Top Chef Masters winner Rick Bayless, plus Graham Elliott Bowles. A live and silent auction will feature a dinner cooked by Season 5's Radhika Desai, and lunch for 2 with Top Chef Las Vegas guest judge Nigella Lawson. 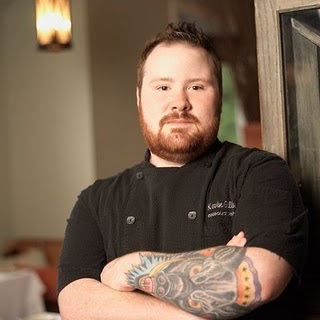 According to Grub Street: On March 19th and 20th, chef Charlie Palmer will be hosting his fifth annual Pigs & Pinot event in Healdsburg featuring chefs Bryan Voltaggio and Kevin Gillespie from Top Chef, along with the Food Network's Tyler Florence and Roland Passot of La Folie. Weekend package tickets are on sale by phone only, at 800-889-7188. StarChefs.com has named the Rising Star chefs of the LA and San Diego areas, and not surprisingly, Michael Voltaggio is one of them. What's been going on with Robin Leventhal since Top Chef? She's been teaching, among other things. Read about it here. 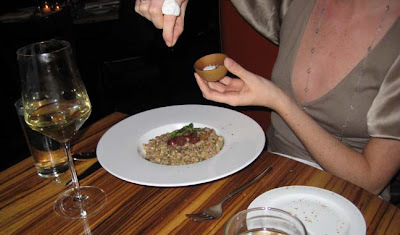 theminx thought she'd get into the act and reprint her MinxEats post about her trip to Harold Dieterle's Perilla, where she dined with ATC's own Laura K., plus fashion designer Malan Breton and model Amanda Fields (Project Runway). 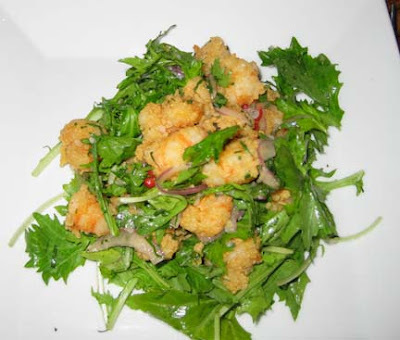 Malan and I both chose to start with the Crispy Rock Shrimp Salad mizuna, piquillo peppers, red onion & spicy mushroom soy vinaigrette. I enjoyed the contrast of the crisp shrimp and the soft mizuna. The dressing was subtle and there was just enough of it to moisten things. The piquillo was a nice addition but I wished there was a little more. We were all so busy chatting, I forgot to ask Malan what he thought of the salad. 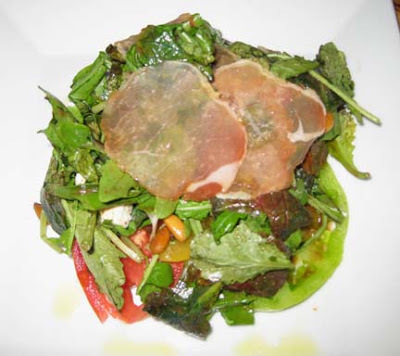 Laura K got the Heirloom Tomato & Lomo Salad toasted pine nuts, red mustard greens, feta cheese & brown butter balsamic. Lomo is a dry-cured Spanish ham, like Serrano, but better. Laura was kind enough to give me a piece to try, and I found it to be seriously delicious. Eric Ripert, Padma Lakshmi, and Gail Simmons spilled the beans on Top Chef during their appearance at the New York Times Arts & Leisure weekend. Entertainment Weekly has the scoop, but here are some highlights. The most egregious act of brown-nosing: Contestants are supposed to keep a safe distance from judges while on the show, but season five’s Stefan gave Padma the leftover roses from his challenge dish. A producer kindly came over and snatched the flowers out of Padma’s hand. Who do the judges keep in touch with? Gail, who was quick to note that she socializes with contestants only after the finale airs, still talks to season one winner Harold and season four’s Nikki. Padma has kept in touch with Dale (season 3) and Hung (season 3 winner), but both women sang the praises of Lee Anne Wong, who went from season one cheftestant to Top Chef culinary producer until the end of season six. “She’s such a great unsung hero,” Padma said. There’s an unofficial fifth judge at that table: Sometimes when the judges can’t decide, the producers will look to the camera operator they call T-Bone, who shoots the still-life shots of the contestants’ dishes, which he eats afterward. Other fun facts: Black beans give Gail “the heebie-jeebies,” and the reason Padma sounds so robotic when she describes the challenges is because she’s wearing an earpiece through which all of the legally approved info is being fed to her. First, lets set the stage. Flashback to - March 9, 2006. I watch the first episode of the first season of Top Chef. I had just returned from Spring Break in the Bahamas (spring break woot woot!) and while on the JetBlue flight, I watched a Project Runway marathon. 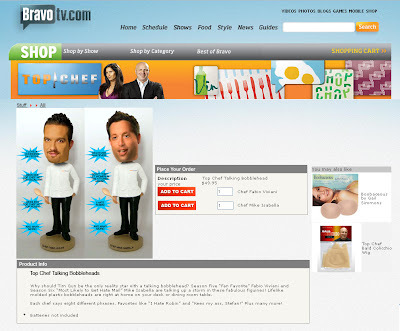 There were endless commercials for this new show called Top Chef. I sit down to watch Top Chef, and I am thoroughly amused. The season continues and I fall in love with all things Top Chef, and with its very first winner, Harold Dieterle. So cute. Such a good chef. 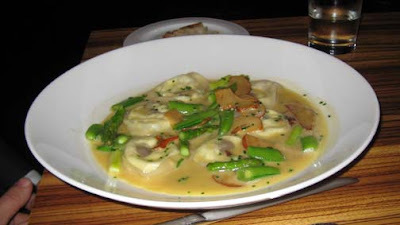 When Harold took the title, he opened a restaurant in NYC called Perilla, in the Village, on 9 Jones Street. Flash forward to - 3 years after Harold wins Top Chef, and I get my day in the sun. I made an opentable reservation for last night at 7:15, to celebrate the holidays with my boyfriend. We turned left off of West 4th street and onto Jones Street, residential, quiet, and quaint. And Perilla was smack in the middle. I am always so impressed by restaurants that have such a strong following, regardless of the fact that they are tucked away on these small side streets with no other restaurants in sight. This means that these restaurants create such a strong buzz, on blogs, word of mouth, etc., that they do not need to rely on "passerby" customers. This restaurant will be a full house every night, on its little side street. And for really nice restaurants where you are spending a lot of money, the fact that the restaurant is tucked away means that the bustle and distraction of what is going on outside of the restaurant ceases to exist. The focus is the restaurant you are in, and the experience you are going to have. So calming. Such a relief. We walked into Perilla. It looked like everything you want a trendy, amazing NYC restaurant to look like. I loved it. They took our coats and seated us immediately at a nice table for two in the back. The waiter asked us if we wanted to order drinks, and we had not looked at the drink menu yet. Then he says water for the table? And I said "Yes, tap" just as he was saying "sparkling or tap?" I love that about some of the nicer restaurants. You even get to choose your own water. We peruse the wine menu. And then, I see him. It is HAROLD!!!! He looks great. Very calm. I was so pleased. Add him to my list of Top Chefs I have seen. My boyfriend ordered a beer, and I ordered a glass of white wine ($10). The wine was fabulous. The waiter poured a little into my glass first to let me try it. That is pretty customary when you order a bottle of wine but not as common when you just order a glass. It was a pleasant surprise. And the wine was fantastic. A sign of a really great glass of wine in a restaurant, for me at least, is that just 1 glass gets me through most of the meal, and I have no desire to order another one. The fact that it delightful, nothing I want to rush through, pleases me. It was $10 so it should be very delightful and filling. Appetizers. Appetizers. Hmmmm. They have some salads. Nah. O wait. SPICY. DUCK. MEATBALLS. Done. We order them and the waiter asks "would you like me to split them for you?" Why sure! They are probably afraid we will make a mess if we reach over to eat them. While we wait for the appetizers, we each get a piece of bread. So, this debate could go on for awhile, but basically at a restaurant, you can get a basket of bread, or a piece of bread delivered to you. Although I love a good basket of bread, I prefer hand delivered bread. Why? Because I have no self-control. If there are 7 pieces of bread in that basket, and I am with one other person, and that person only wants 2, well, I am going to eat the rest of it. It is there. I am hungry. And I want it. But I know I should not eat SO MUCH bread before an amazing meal. At Perilla, you get the hand delivered bread. It was good. Small. They pour the olive oil in a little dish. I kind of wanted another piece. A few minutes later, another piece came! Yay! But then, within the next ten minutes, we each got two more pieces - 4 pieces of bread delivered to our table. It was kind of strange. They just kept filling up our bread plates like they were glasses of water. I had to stop eating the bread after the third delivery. From my point of view, hand-delivered bread helps me manage what I eat, but not when you deliver so many pieces. Spicy duck meatballs arrive. We each get our own dish. This appetizer was the best appetizer in the world. Hands down. I do not like super spicy things, but this had just the right amount. Do you ever watch those food shows and the judges say "you can taste the smokiness that was infused in the meat and cooked in a bag and blah blah blah" and you just think, "what the hell are they talking about?" With these spicy duck meatballs, there was a spicy kick and flavor to it that was just part of the meatball - there was almost something intangible about the flavor, that made it so exciting. So far, I am in love. I have had some hand delivered bread, am enjoying a lovely glass of white wine, all of the people in the restaurant are just as happy to be there as I am, and I have a spicy duck meatball taste in my mouth. The waiter checked in on us occasionally. He was so cute, and really knew the right balance of "how are you doing?" without bothering us. Moving on. Dinner arrives. My bf ordered the Hanger steak, and I ordered the Kingfish, which came with braised kale, applewood smoke bacon (YES), and polenta fritters. The kingfish, pictured here (you can see the steak in the back) was delightful. Very light. The polenta fritters looked like croutons, like when you try to tell kids lies about what they are eating. Hey kid have a crouton (mwahaha it is actually polenta). The kale, which was not the main event of the dish, was incredible. With bacon, yes please. Amazing. The steak was also incredible. I loved it, and usually steak is just fine for me, but not amazing. This steak was amazing. The sauce was excellent. I ate most of my meal. Usually with these small dishes, I devour it. But everything here was so delightful, that I took my time, and was actually pretty full when I had a few bites of fish left. The waiter asked us if we wanted to see a dessert menu. I was a little full, but I did not make a reservation to finally go to Perilla without dessert. We went with the dark chocolate ice cream sundae with hazelnut praline and marshmallow. Look at it. Homemade marshmallows. Yes. Amazing ice cream. Yes. Pralines, ohhhhhh yesssssssssssssssssssss. We loved this dessert. I love simple ingredients that combine to make something incredible. And I love ice cream sundaes. The bill came. It was $100. My bf's fun times on a casino trip earlier in the week left NYCMenuGirl with just paying the tip. I wanted to tell you how much it was so you can gauge how your dream restaurant might fit into your budget. This was one of the absolute best meals I have had in NYC. Everything was not only cooked amazingly, but every single thing I ate was so unique. Kale - I have had that. Kale with bacon - never had that! It was so pleasant. The music was great. The waiters were cute. There was an abundance of bread. The energy and ambiance of this place made it a most pleasant evening. For a special Christmas dinner, it was worth a splurge. Top Chef guest judge Eric Ripert, a hugely pregnant Padma Lakshmi, and Gail Simmons attended the 9th Annual New York Times Arts and Leisure Weekend at TheTimesCenter on January 9, 2010 in New York City. What was Gail doing to former NYT restaurant critic Frank Bruni? Doesn't he look terrified? Yesterday's Television Critics Association Press Tour revealed that the second season of Top Chef Masters will premiere April 7 at 11PM before moving to its regular time slot at 10PM the following week. Food journalist Kelly Choi will return as host, and regular Top Chef judge Gail Simmons will serve as a judge this season as well, joining restaurant critic Gael Greene, culinary expert James Oseland and food critic Jay Rayner. Good news for Gail Simmons fans: she will also be hosting the upcoming Top Chef: Just Desserts, which is still in development. For more of the Voltaggio Brothers, visit their Web site at VoltaggioBrothers.com. My name is Evy and I am a Top Chef junkie... I am such a junkie that I own the Top Chef cookbook and Wednesdays at 10:00 are sacred... In the spirit of my junkyness I decided to start trying out the restaurants that some of the cheftestants work in. This is limited to those restaurants in Atlanta or South Carolina. I started with Woodfire Grill, owned by Kevin Gillespie and YUM!!! We decided to go with the 5 course tasting dinner and to me it was a great idea not knowing what we were going to get and tasting what the chef believes are his best recipes. As soon as we were seated, we were given the amuse bouche... Fried Okra with garlic aioli. I hate okra and I totally despise Fried Okra but this was amazingly good. I was happy. The tasting started with olive oil poached shrimp on a shrimp toast with microgreens and some type of aioli. It was divine, the shrimp felt like butter and to be honest I have never tasted such delicious and tasty shrimp. I was in heaven. The second course was Pan-Seared Diver Scallop on top of a Lima Bean puree with Bacon Jus and Smoked House Bacon. I do not love the texture of Scallops, i find them chewy and weird but the taste was incredible. I still do not like scallops so this was my least favorite dish of the night. The puree was really good as was the Bacon, I found the bacon just a little sweet but still amazing. While we waited for the third course we were given an intermezzo... Green Beans. As you can see I sucked at paying attention at the name of this course. The green beans were good but they had too much acid which made them a little bitter. The Third Course was my first OMG!!! It was roasted quail on top of peppered corn grits with raised greens. I've never had grits before and if they all taste like those ones I have been converted. They were delicious and amazing and a little piece of heaven, however they were nothing compared to the quail. HOLY JESUS! (not really trying to be blasphemous here) That quail tasted so incredible, so delicious, and so amazing that I was upset that my plate wasn't bigger. After it was over I kept wanting more. Before the Fourth and Final Main Course we were given another Intermezzo to clean our palate. This was an orange sherbet. It was good, nothing earth shattering but good. The dessert course... OH Lord... The dessert Course, we were given different desserts. Manuel was given the moist chocolate cake, maple panna cotta, brown butter cream sauce, chocolate ganache and toasted pecans. I was given the banana fritters, milk chocolate mousse, banana bavarian cream salted caramel, candied bacon. At first I was apprehensive... HOW DARE THEY NOT GIVE ME CHOCOLATE! but they gave me bacon and candied bacon which should be one of the wonders of the world. There are so many things that were right about that dessert that I can't even start mentioning them... Another thing that I want to say was that neither Manuel or I wanted to share our desserts... they were THAT good. The salted caramel was delicious and I really wanted to lick the plate afterwards... which might have been a little frowned upon but I did not care... I almost cried when a piece fell off the plate and into the mantel but I quickly applied the 5 second rule, there was no way I was going to let anything ANYTHING go to waste. Creative Loafing's final Top Chef podcast of the year features Michael Voltaggio. Click here to listen. Seven Springs Mountain Resort in Seven Springs, Pa., hosts the second annual Gourmet Getaway Friday-Sunday, January 8-10. Bryan Voltaggio will headline several chefs giving demonstrations. Cost is $399 per couple including two nights' lodging and several meals. Day packages available. Call 1-800-452-2223 or go to 7springs.com. Jennifer Carroll has come in at #2 on the FYI Philly Top Ten List of What's New for 2010. Her part of the segment starts at around the 3:30 minute mark. Poll - Where Will Top Chef 7 Be Located? ...to Jennifer Carroll's mom, Joan, who had brain surgery last week. Please keep her in your thoughts and prayers. 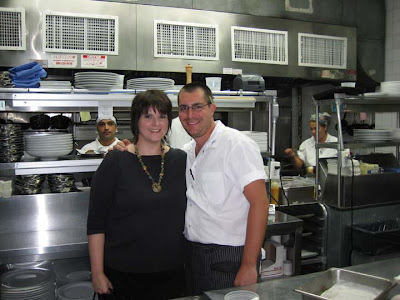 All Top Chef reader Meghan, of the blog Travel Eat Love, shares with us her dining experience at season 4 cheftestant Erik Hopfinger's restaurant, Circa, in San Fransisco. Take it away, Meghan! Our drive to San Francisco was nothing short of stunning. We made it just in time for our dinner reservation at Circa, where Top Chef contestant Erik Hopfinger is the Executive Chef. We started with the hummus and tzatziki. I love grilled bread. Its so simple, but so delicious. 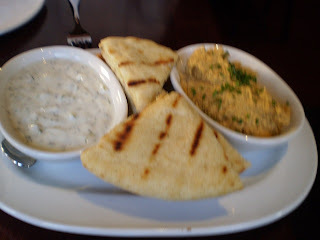 The hummus was a tiny bit smoky and spicy, and the cool cucumber laden yogurt added a nice creamy balance to it. 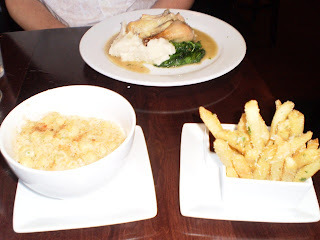 For our main courses we split the truffled lobster mac and cheese, the roast chicken with spinach and mashed potatoes, and of course, the parmesan truffle fries. These were all true comfort foods and were perfect after a long day as the night got chillier. I had a few bites of the chicken which was juicy and tender and paired perfectly with the spinach, which was just amazing. I don’t often enjoy cooked spinach, but this still had some bite in it; it wasn’t mushy or overdone at all. The prices were very reasonable, and the food was just to die for. We cleaned the plates and left stuffed and satisfied. The atmosphere was sort of big city chic but with a level of comfort that made us feel right at home and perfectly relaxed. . . so much so that we were slightly falling asleep after our long day! Chef Hopfinger was in the kitchen which was visible from our seats, and I wanted to say hi but didn’t. Maybe next time. . . I should probably get over my shyness if I ever want to work in the food and wine industry! After that we drove around a bit, watched the sunset, took a spin through Castro, and called it a night fairly early, still adjusting to the time zone and totally happy after a day in the valley. The results of All Top Chef's very informal, extremely unscientific poll are in. We asked you who of several men was most likely to be the father of Padma Lakshmi's baby. Almost a quarter of you were honest and didn't venture a guess, choosing "I don't know." Billionaire Ted Forstman came in first among the actual candidates, with 19% percent of the vote. And amusingly, Michael Voltaggio came in second with 17%. This video is old, but I had never seen it before today. Season 4's Lisa Fernandes shows us how to make Chinese dumplings.